Here Giselle's tree is loosely placed over top of the tiles. It will be fused into place permanently once all of the background tile work is completed. A paper pattern of the foreground lies over top of Carol's completed night sky. 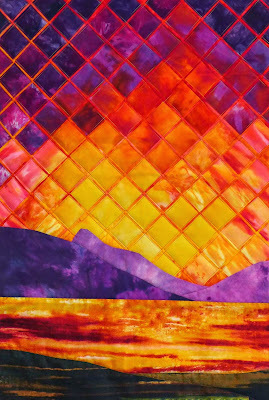 Faye and Eryl (next 2 photos) came prepared with their own hand dyed fabrics ready to create a sunset (or sunrise) scene. These two ladies were extremely efficient and focused and therefore, made great progress in class. Both had their tiles fused and stitched into place before the workshop ended. With tiles fused and stitched into place, Faye has started working on the silhouette of a tree, which will become the focal point of her piece. The reflection in the water that Eryl has created in the foreground mirrors for the sky perfectly. In her own work, Gloria Loughman uses diamonds and triangles as well as squares and rectangles. However, to keep things a little more straightforward and simplified, the majority of students chose to work with either square or rectangular tiles. Quita placed her rectangular tiles on the diagonal. This creates a very different effect from tiles that are placed in straight rows. Deanna has chosen to use her square tiles on the diagonal as well. The next two photos are of my LIP (Landscape in Progress). I took this photograph at the "Bambouserie", a bamboo forest in the south of France many years ago. 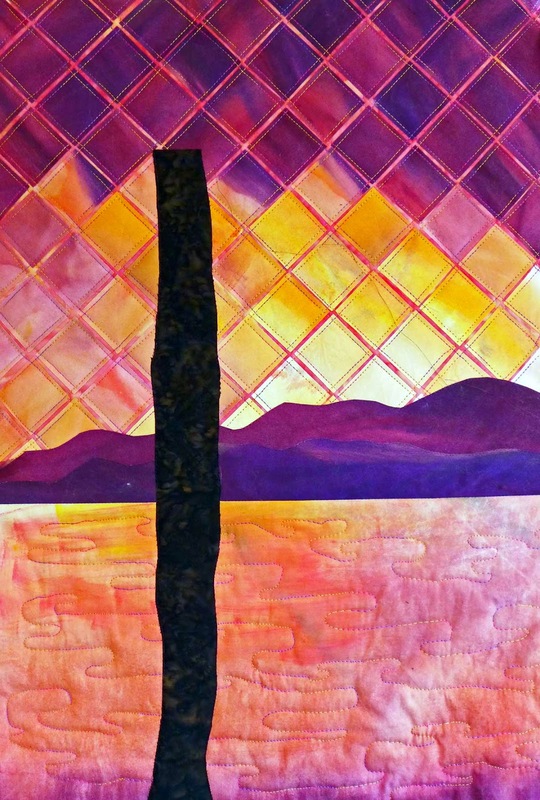 At the time, I had hopes of creating a quilted landscape, but because I had no experience with this type of design and no real idea of the direction that I wanted my quilt to take, I left it alone, but never quite forgot about it. 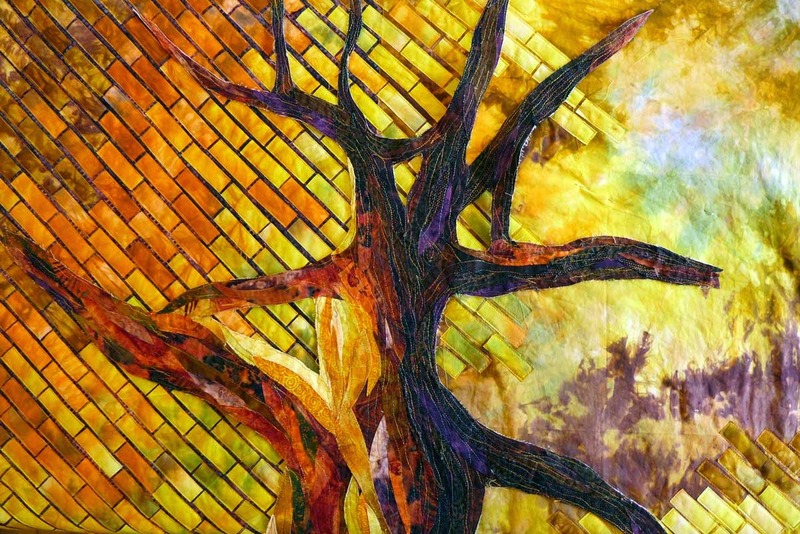 Since then, there have been several textile artists whose work I have admired, Gloria Loughman being one of them. 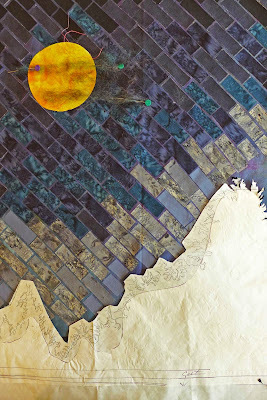 After having bought her book "Radiant Landscapes" in 2010, I was inspired to work up several design layouts, with the one pictured below becoming the basis of this workshop piece. It is designed as a triptych and I am currently working on the center portion of the photograph. 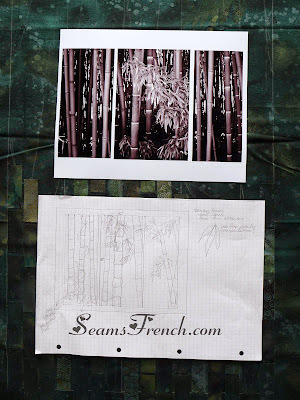 Because I chose to work with monochromatic colours, working with a black and white print of my bamboo forest gave me a better guide for choosing values. 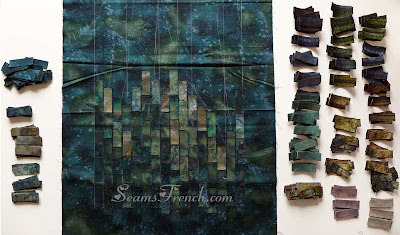 My work so far, with my colour palette of pre-fused fabric tiles on either side. Working on this landscape is a great creative learning experience for me and I am having lots of fun playing with it. I do hope to finish this piece some day, but right now there is more pressing and (quite frankly) more exciting stitching in my immediate future, like baby quilts and other baby "accoutrements". Granniehood is on the horizon for me and this Gran E is seriously inspired and prepared to fulfill all stitching requirements. I love the colors you chose for your quilt. It has a dreamy nighttime quality to it. What will the finished size be? And is this approach strictly for art quilts or is it ever appropriate for everyday quilts? I've never seen anything like it before - it's all very intriguing! This quilt is a whole new ball game for me, but I am having a lot of fun with it. The finished quilt, (if I ever get that far), will be 3 separate pieces. 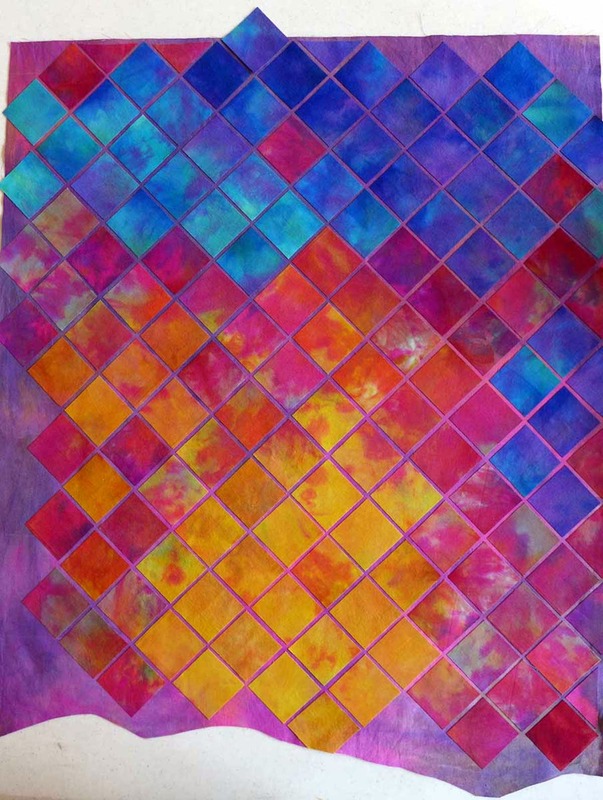 The middle section, which I am currently working on, is 22" x 48". The side panels will each be 18" x 48". I personally would not use this technique in making a quilt that is meant for everyday use and would require frequent washing. 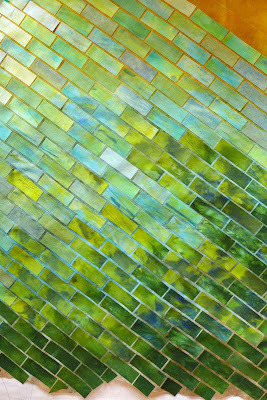 The tiles are all fused onto the background and stitched into place with raw edges. I found that even when just working with the tiles, some of the looser weaves would fray a little. But that's just me; I like everything properly tucked and cleaned up. Other people, I'm sure, are less uptight about that, and don't mind a few frayed edges. It would also depend on what type of quilt you were making. Large shapes with raw edge applique might work just fine. Many quilters do in fact, use raw edge applique in everyday quilts, but then there is more attention paid to stitching the shape onto the background fabric. Let me know if you ever try it on a regular quilt. Such an inspiring set of photos! I love Quita's greens - I always go for green, I think! You are off to a great start with yours too. It's going to be an excellent complement to your bamboo design. As I said last time, there will be wonderful depth to the piece. Onwards! Thanks Monica. As I mentioned in my blog, this bamboo landscape has been floating in my head for the last 8 years or so. Now that I am finally working on it, ideas are solidifying for me, and I have a better notion of where I would ultimately like to take it. I only hope I live long enough!!!! Onwards indeed! 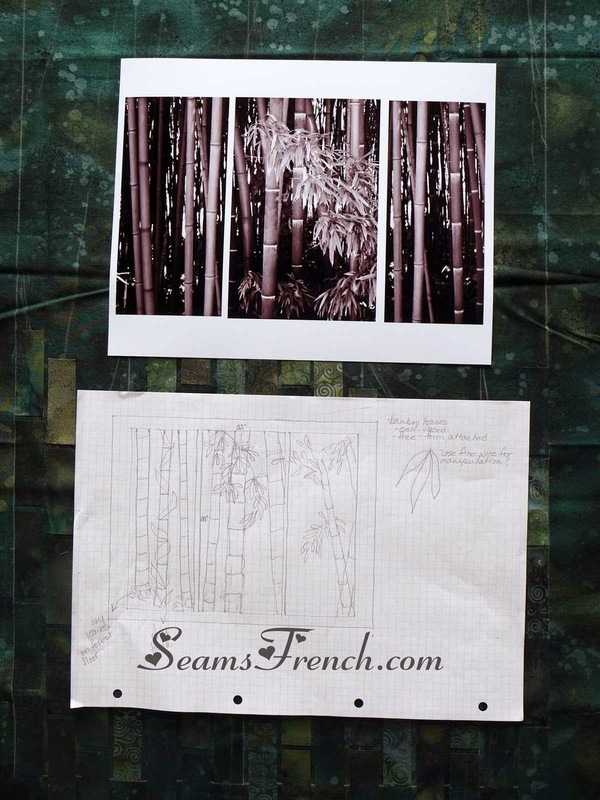 Love your bamboo drawing! And the dark colors you have chosen will be lovely. It was fun to see the work of the other participants as well. Looked like it was a great workshop! Thanks averyclaire. The workshop was fantastic, especially meeting and working with other quilters, each who comes at the project from a different perspective. Very educational and inspiring. And..., Gloria is a great teacher. I would take another workshop with her in a heartbeat. Congratulations on your upcoming Granniehood! That's great. I, too, will be a first time Nana in late February. So many baby things to think about now! Hi Karen. Congratulations to you too. Isn't it fun to think of sewing baby things. And... of course this means a whole new stash must be started:) What fun! We'll have to swap stitching ideas.